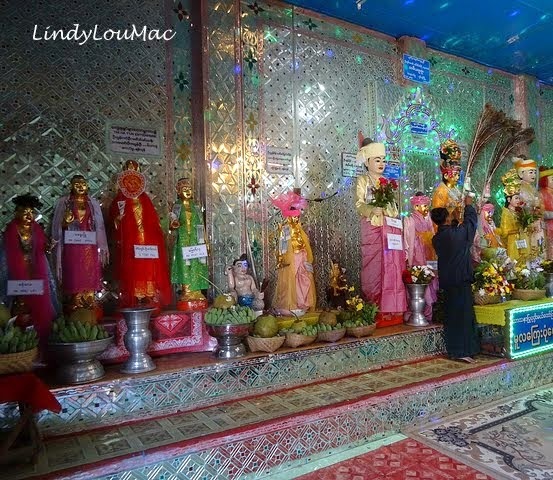 Our next destination in Myanmar was Inle Lake, where we were based in Nyaung Shwe at the Aquarius Inn. The town is the oldest of the Intha settlements around the lake. With the recent revival of tourism the town has grown considerably and is a good base for exploring the lake from with a good selection of accommodation and restaurants. The Intha people were the defining and most lasting impression of this region for me with the fishermen that propel themselves across the lake with one leg wrapped around an oar. We took a private guide and had a very full day exploring the lake with him. It was very cold and misty when we departed at 7.30 am and we were very grateful for the blankets that were provided in the boat to wrap ourselves in! Our transport was the yellow and green boat approaching the jetty. It was a very busy day with lots of stops visiting the villages on stilts around the lake to view locals at work on a whole range of artisan crafts, weaving, silver work, cigar and paper making. 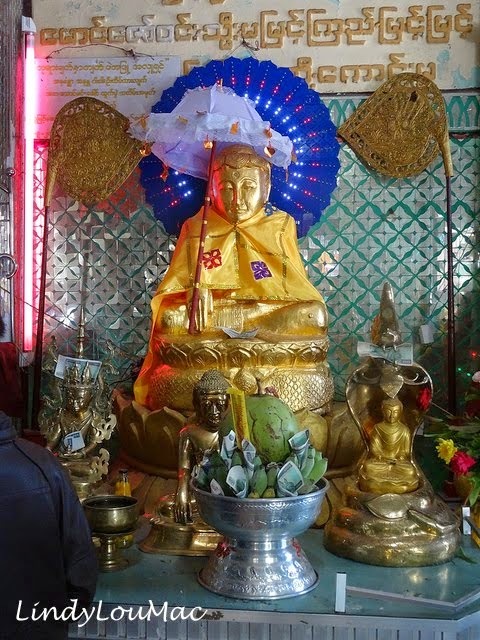 We also visited Phaung Daw Oo Pagoda and Nga Phe Kyaung Monastery. By 10 am the early morning mist had cleared and it was a beautiful day, hot with clear blue skies. I had many opportunities for photography and it has, as always, been difficult to select just a few to share here with you, for more photos please visit my My Flickr Album, Inle Lake. I am also planning to feature these artisan crafts in more detail on my photo blog feature World at Work during 2015. Stilt village of Inle Lake. 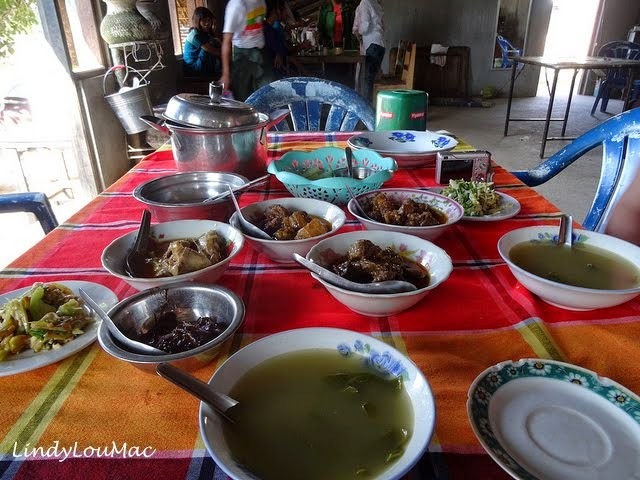 We had lunch here - Soe San Kaung Restaurant. Part of the paper making process at an umbrella workshop. Weaving by a lady from the Padaung tribe from Kayah State in Burma wearing a traditional coil to lower her collar bone. A floating vegetable garden which has been made by collecting weeds from the lakes surface and lashing them together, before fixing them to the lakes bed with bamboo poles. Crops are then grown regardless of water levels. The final five photos show our journey back across the lake and the approach to Nyaungshwe. If you are interested in reading my earlier posts about Our Myanmar Trip here are the links. Whilst I was in Italy recently I wanted to attend a Sagra delle Castagne, a Chestnut Festival. It was the right time of the year and there is a special taste to freshly roasted chestnuts, cooked in the open air. I was therefore delighted that after lunching with friends in the area, that we were able to attend the 47th Chestnut Festival in Soriano nel Cimino in the late afternoon and evening. It is a very popular event and as you will see from my photos the crowds were enormous. Fortunately my friend knew that parking would be a problem so we caught a courtesy bus that was running people up and down to the centro storico, perfect solution. There was a lot more happening than just the roasting of chestnuts with enactments of historical events taking place. If you want to know more about the event do visit the Official Website. Flag bearers and musicians of the Noble Contrada Trinity - Exhibition on the occasion of the 47th Chestnut Festival Soriano nel Cimino (VT) - October 4, 2014. With thanks to the following sites for the background information included in my post. The links will take you directly to the official websites if you are interested in learning more about this event. All photos are my own taken in October 2014 unless otherwise mentioned. 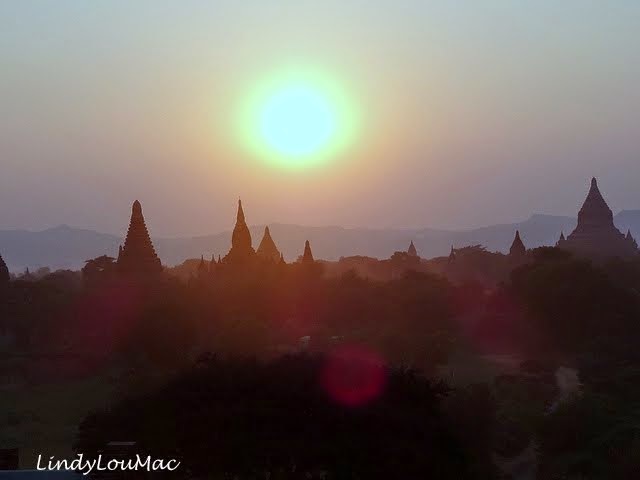 Bagan is an ancient city located in the Mandalay Region of Burma. 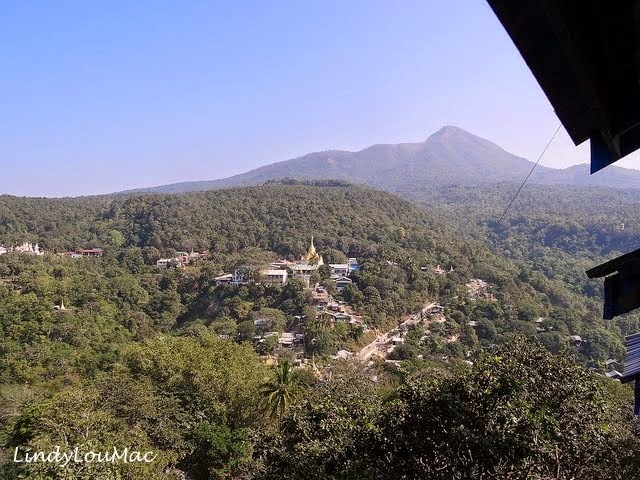 From the 9C to the 13C the city was the capital of the Kingdom of Pagan, the first kingdom to unify the regions that would later constitute modern Myanmar. Arriving in Bagan we were met by the friend of our guide in Mandalay, taking us directly to our guest house 'Mya Thida', having paid our 15 USD tourist fee to enter Bagan. The first sign that Bagan was going to be more touristy. Having settled into our room, we walked into the centre of 'New Bagan', for a meal. A bustling place due to the area being a very popular tourist region, evident by the number of restaurants there were here, great places to people watch, tourists and locals and watch the world go by. We selected 'Silver House' which met exceptions from our Lonely Planet Guide. The next day Christmas Eve we had a very busy day with our guide exploring the 'Bagan Archaeological Zone' A temple packed day, the most amazing place it is no wonder that tourists from all over the world are now visiting this region. This was evident in the sheer numbers of people that were present on the terraces of the Shwesandaw Pagoda which provide an excellent viewpoint to watch the sunset from. A spectacular sight it is no surprise it attracts so many people, the place was swarming with people vying for places to take photos from! Luckily our guide got us there early enough to establish a good viewpoint. A Christmas Eve sunset I will never forget! 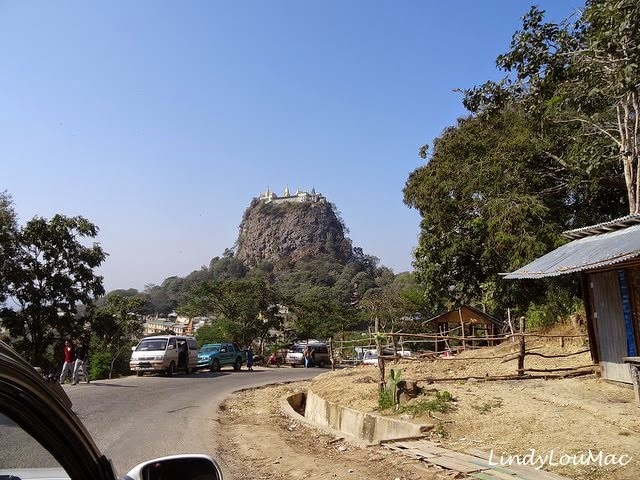 On Christmas Day our guide and his cousin drove us up into the hills to Mt Popa about 30 miles from Bagan and due to the condition of the local roads about a 90 minute drive. 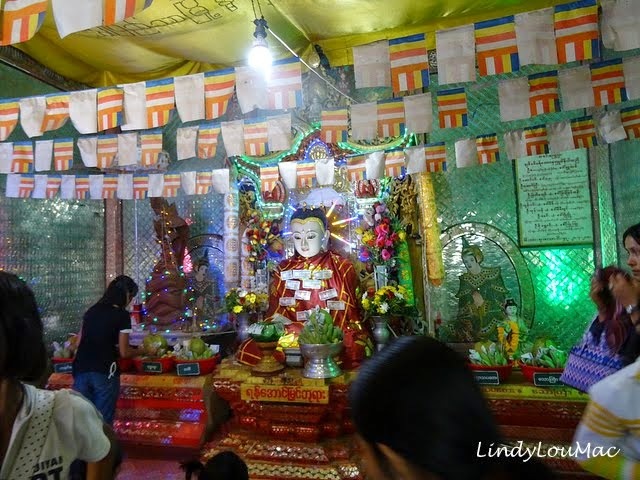 The main purpose of this half day trip was to visit the Nat Temple of Popa Taung Kalat. 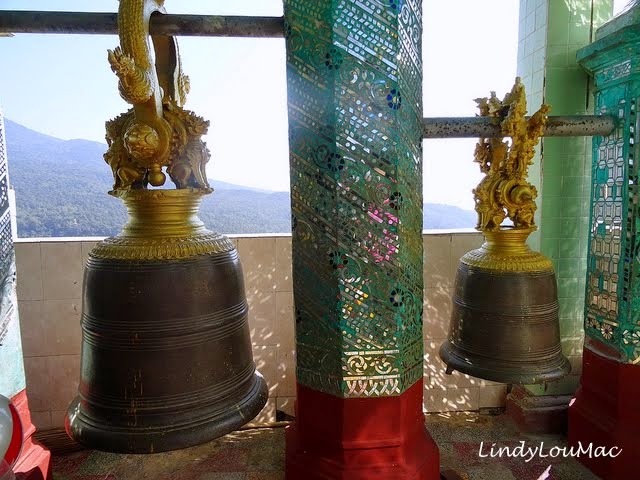 The Monastery is built on the top of the mountain at 1518 mt( 4981 feet),this period is also a holiday time in Myanmar with schools closed for ten days, it was particularly busy with many locals making the pilgrimage up to the temple. It took us a good twenty minutes to ascend the 777 steps up to the top, fortunately Ng Ng, agreed to accompany us. This made it more interesting as he was able to explain things and knew the easiest way to navigate ourselves around the vast complex especially as it was so busy. 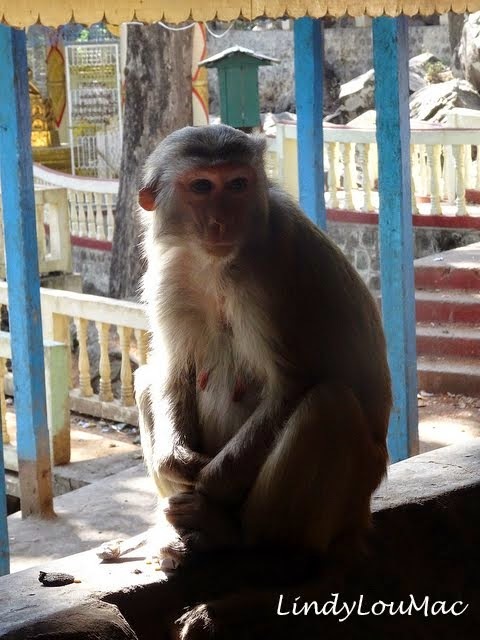 I did manage to get a few photos of the monkeys etc, despite the crowds, and of the view from the top. On the way back to Bagan we stopped at a typical Myanmar restaurant for locals, I doubt many tourists stop here, certainly not foreigners! We were definitely a novelty but accepted as we had a local with us, Certainly the most bizarre Christmas Day lunch I have ever eaten, with no idea of what it actually was either, not particularly tasty but edible. A different and interesting experience. Spent the latter part of the afternoon chilling out on our terrace back at the Guest House before Ng Ng, returned to take us out to another sunset viewing location in the Archaeological Zone, Pyathada Paya, another stunning unforgettable sunset. Although I have to say I will also remember the antics of the many tourist buses, trying to navigate around the temple area! Christmas was indeed a very different experience and I made new memories to cherish. 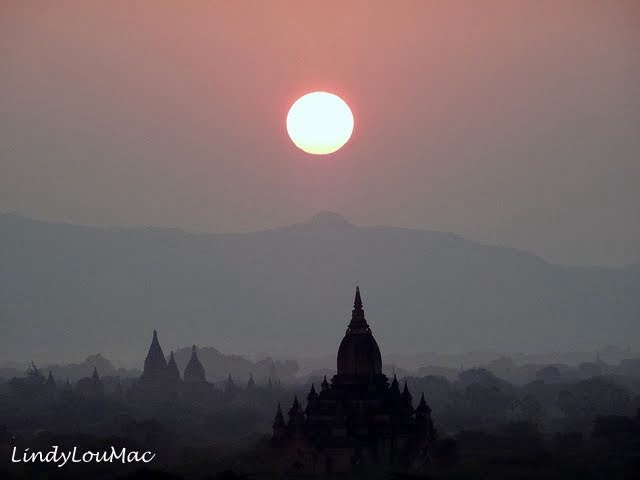 We could easily have spent much longer in Bagan, but it was time to move on and discover more of this stunning country. 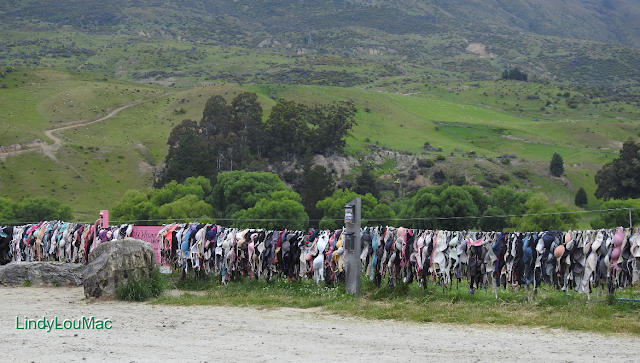 I hope you have enjoyed my words and photos about this still relatively unspoilt destination. 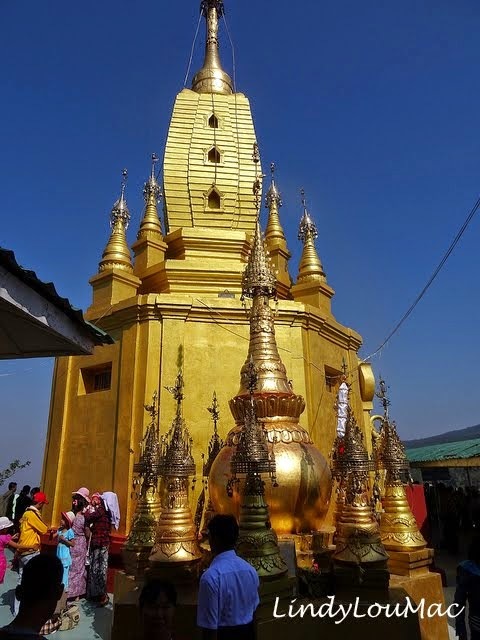 Although the tourists are discovering Bagan and hawkers are present at the more popular temples, there are only a handful that are regularly visited. There is still much to offer the intrepid tourist in Bagan, with time to explore. An amazing place and an experience that is difficult to put into words. This video I found on this Website will give you a great impression.